For many marketers, personalizing communications is often a daunting task – they often don’t have the data they need to create the type of relevant communications that can spark a deeper connection with their customer. But even marketers who don’t have a lot personal data on their customers can still get closer to their customers. All they need is one data point: location. Location is a powerful force in creating a personal connection with your customers. locr can help you use location to your very best advantage. 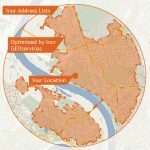 To start, we offer a GEOanalytics service that ensures your direct mail campaign is reaching exactly the right prospects in exactly the right location. GEOanalytics compares your mailing list to the location of your business. Then, using our proprietary software, we analyze your list and refine it so that you are only targeting prospects in the exact geographic area you want to target – right down the rooftop. Refining your list not only helps you get closer to your prospect, it can also save money on postage and printing costs. Once you target by location, you can then provide additional geographic details like maps, travel time, and distance. Adding these elements further enhances the customer relationship, and guides the customer to your business. To learn how to use location to create customized communications, email us at info@locr.com.